Bodicote resides in North Cherwell. Bins are emptied on a Tuesday on alternate weeks, blue and brown one week, then green the next. All households receive a blue bin for recycling, a bin brown for food and garden waste and a green bin for rubbish. If you find you are missing a bin, please contact Cherwell District Council for a replacement. If you have extra recycling, additional bins are available to order at an online cost of £30 and come in two sizes: 140 litre and a standard 240 litre. Households are allowed up to five recycling bins, any combination of blue and brown, and batteries and small electrical items are also collected weekly, alongside waste collections. Just pop them in a separate bag and place on top of your bin on collection day. Damaged, or missing bins, will be repaired or replaced by Cherwell District Council, free of charge. If you have placed your bin out for collection and it has not been emptied, report your missed bin as soon as possible. 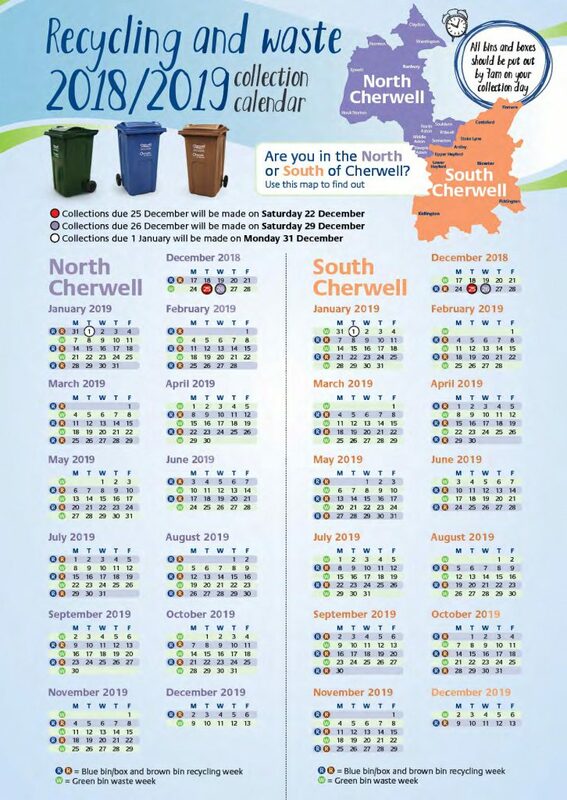 Cherwell District Council aim to collect missed bins within the next 4 working days (Tuesday to Friday).